I'm afraid this little blog has been sorely neglected, but I'm wondering if anyone would miss it if it went away....if you would, then please leave a comment. Otherwise it's on the way out....forever. Blogs are strange things. For awhile they were really fun ways for everyone to keep up to date with friends and their "doings". It seemed especially great for crafters to share projects, for photographers to showcase photos, cooks to offer recipes, etc. but now it's become a really big business and I'm afraid that we mere amateurs are a dying breed. Some enterprising individuals are even making a living being a blogger! That may work for some, but it's very time-consuming to keep fresh and to blog often, that is unless it really IS a full-time occupation. For those kinds of blogs, you get company endorsements, free products to try, and lots of feedback. It hasn't worked that way for me, but because I simply don't have the time to devote to it. Here's what I've been up to since the last post. 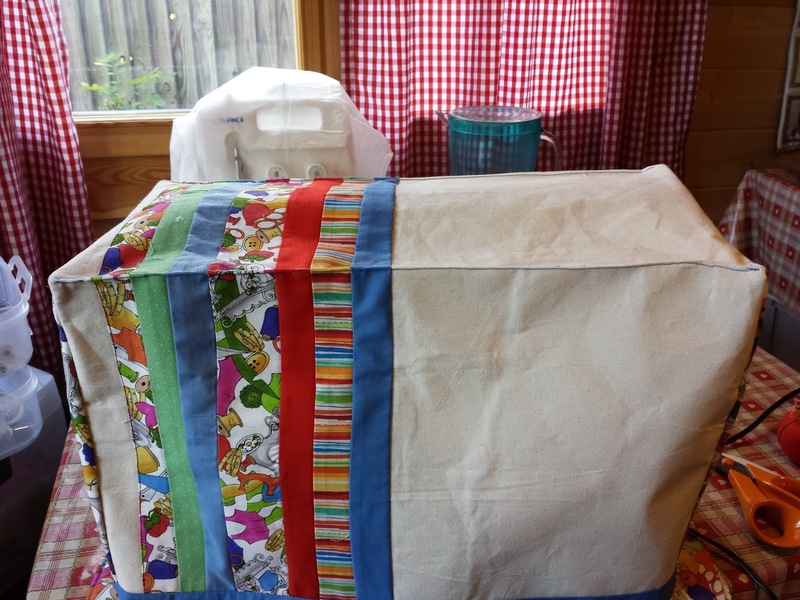 First I made a sewing machine cover to match my "sewing tidy". I didn't have a pattern, I just measured my machine, then threw myself into it. I'm happy with the way it turned out. 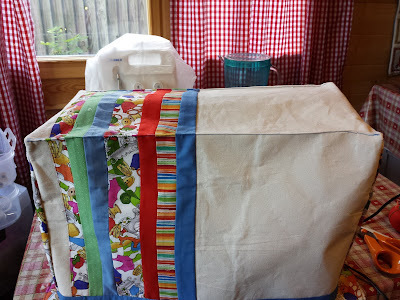 I used some scraps of the same fabric as the sewing tidy (shown here with the machine sitting on it) and plain muslin (or calico). I wasn't really satisfied with it until I ran a top stitch around the top, however, as it needed more "definition". Now it seems to sit better. 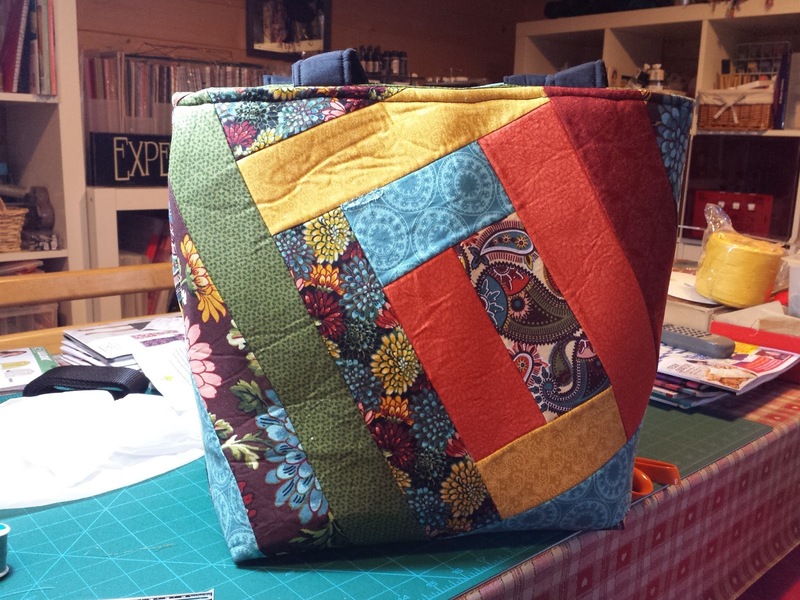 Next is a patchwork tote bag. I didn't really have a pattern for this either, but followed (loosely) a video on YouTube from the Missouri Quilt Company and Crafty Gemini. The first photo is the front, the second is the back. The bag is made from less than a half-jelly-roll and a base of Bosal-In-R-Form Plus, a kind of fusible foam fabric. 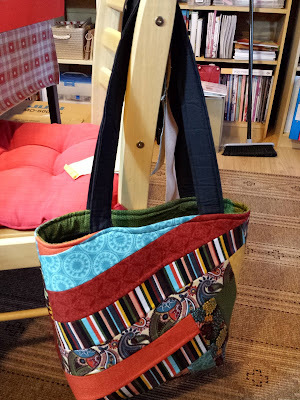 It keeps its shape almost perfectly so it's perfect for making bags and anything with a shape. It's really easy to use but I found it a little fiddly due to the fusible feature. It's too easy to get it wrinkled. You could make covers for iPads, laptops, smartphones, etc. and the video is very easy to follow. Next I made a little fabric box for trinkets, pins, cotton balls, jewelry, or whatever you need it for. These also are easy-peasy. 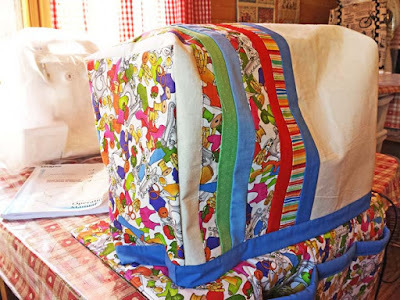 They're made from two 10" square pieces of fabric and a little wadding (UK) or batting (USA). 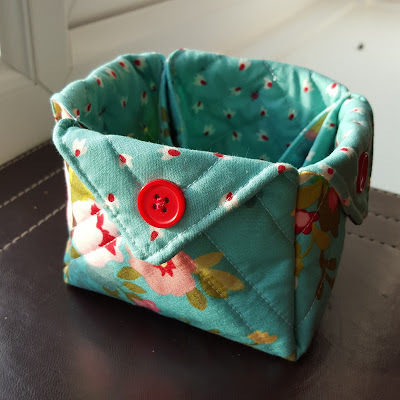 I found this tutorial online also, at http://seaside-stitches.blogspot.co.uk/2013/03/fabric-box-tutorial.html. I made a different one for each of my craft group friends for our Christmas meeting. For crafty things, that about sums it up. I had some foot surgery that has really knocked me back about two months...and counting. I'm looking forward to a new year for 2016. I just want life to get back to normal. For anyone reading this, I hope you have a wonderful and happy Christmas and a great new year. I don't think I'll keep the blog open unless I hear from someone, anyone, so I know it's being read. As an even more amateur (and infrequent) blogger, I agree with your comments on the changing face of bloggersville! But I enjoyed reading yours, especially seeing your 'real' sewing room - not some fancy room which looks like it's never been used! A sewing room is full of works in progress, it can't be tidy! Keep up your blogging! Thanks for your comments. My room is definitely not a show room.... it's in a constant state of untidiness, but I love it nonetheless. And yes, it's full of works in progress. Some, I fear, will never ever see completion!